Yesterday was all about Betty, now for Bobby! Here he is dressed up as a cute gingerbread boy. This whole card is chocolate cardstock, my pic just makes the bottom look black. I used liquid pearls for the frosting and CE on the candy cane. The green frame is popped up on dimensionals with the sentiment stamped inside the "window". And here's blonde Bobby carrying a stack of presents. I pieced the presents and added liquid applique to his trim. Thanks for stopping by! Let's go see what the other designers are peeking! Jodi Ann, Lauren, Lise, Maria, Mariska, Sarah, Vicki, Mackenzie Bruckler (guest), and Tracey Cuccia (guest). Again two gorgeous Becky originals :). I love how you paperpieced the presents for your second card and how the green frame pops up in the first. So funny that you already knew what I was going to say about your card yesterday :). I loved your sneak peeks for this release sweetie!! These are so adorable Becky! I am loving these cute images!! fun stuff! love the blonde bobby card, such a unique holiday color scheme-gotta love that jolly by golly holiday paper! Hey Becky! I jsut had to come over (finally) and say love ALL your samples with the new release sets! Theya re so cute! My fave is the snowfairy one-WOW!!! You rock! Both of your cards are absolutely Scrumptions Becky!!! Nice work! 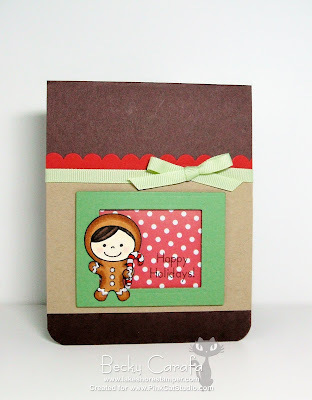 Oh, your Bobby cards are so darn cute, Becky! Great choice of dps on both your cards. . .I especially love the yellow on your second card! Such a bright happy color. Very festive! Awesome job on this month's sneak peeks! These are just adorable!! Love the papers you used! I ♥ the paper piecing! Those colors on the second card are just SO fun -- I love it! So glad I got to play along with the 'rubber team' this month, it's been a blast! Becky, your creations are so sweet! I love the dp and paper piecing!